Supporters of Muslim Student Organization chant slogans during a protest after the Supreme Court overturned the conviction of a Christian woman sentenced to death for blasphemy against Islam, in Islamabad, Pakistan, Nov. 2, 2018. FILE - Pakistani demonstrators take part in a protest the killing of journalism student Mashal Khan in Karachi, April 22, 2017. 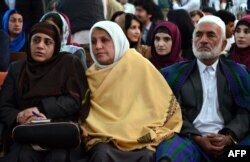 FILE - Relatives of Afghan woman, 27-year-old Farkhunda, who was beaten to death by a mob, attend a hearing at a court in Kabul on May 6, 2015. Four Afghan men were sentenced to death for the savage lynching of a woman falsely accused of blasphemy. 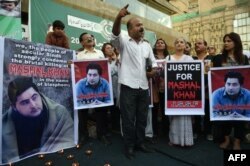 In April 2017, Mashal Khan, a student, was beaten to death by his fellow students at his university campus in the Mardan region of Khyber Pakhtunkhwa province. Khan was accused of posting blasphemous materials on social media.